More mountain bike fun is hardly possible. 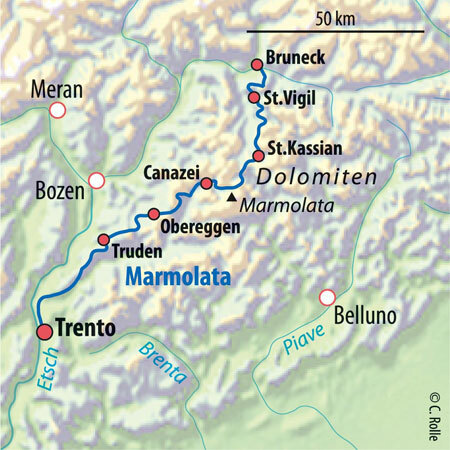 The Transalp Marmolada crosses only the most beautiful part of the Alps: the Dolomites from Bruneck to the old market town of Trento. In between, you'll experience rides and mountain landscapes that are hard to beat. We'll be in view of the Dolomites at all times. We intentionally kept the daily stages short to have time for the paths, some of which are quite technical, and the wild rock formations. A Level 3 highlight. The almost 2300 m high summit of the Kronplatz ("crown place") has its name for a reason. Once we've conquered this summit, the main Alpine ridge and the Dolomites are literally at our feet. We will get the ascent done by lunchtime. Then we'll enjoy one of the most beautiful downhill trails in the Alps, descending to the touring paradise Sankt Vigil. Already, we're in the middle of the giant white mountains. Traversing Riedjoch with a view of the famous Fanes massif, we will proceed directly under the towering walls of the Santa Croce. The Church of the Holy Cross is our midday destination. Afterwards, we'll descend on trails, some of which are technical, to the hotel in St. Kassian. A day of mountain biking can hardly be more impressive. Just like yesterday, the highlights don't stop coming. We'll get closer and closer to the Marmolada glacier. After a busy morning, the cable car will help us ascend to Porta Vescovo, which is almost 2500 m above sea level. Riding the legendary Bindelweg, we'll reach Canazei/Campitello. The rose garden and the crags of the Vajolet Towers are our midday destination today. Then we'll take a wonderful high altitude trail along the flanks of the mighty mountain above the Karerpass and the Karersee (lake) to our stage destination in Obereggen. With the Dolomites behind us, today we'll enjoy beautiful South Tyrolean views and wonderful trails. Once again, we'll climb up to 2000 meters as we head for the Weißhorn mountain. Then we'll ride on hidden paths to Truden. Overnight stay in a bike hotel with sauna. Both gaining altitude and riding pleasure characterize today. Italian villages are drawing closer and closer. After a seemingly endless downhill ride, we'll reach the episcopal city of Trento – a worthy destination for our crossing of the Dolomites. Stylish accommodation in a hotel in the old town. After breakfast, the bikes are loaded onto the bus. Return trip by bus back to Bruneck. Upon arrival, everyone travels home individually. Olaf Reinartz, ALPS bike guide for the Transalp Marmolata and Transalp Maloja. Arrival: Arrival by car or by train to Bruneck/Italy. Type of route: Gravel paths, single tracks, secondary roads, a few stretches of pushing. Included in the price: Guided tour with 7 overnight stays and half board (breakfast buffet, multi-course dinner menus, farewell dinner) in good 3- or 4-star hotels in a double room, often with wellness areas. Cable car, luggage transport, return transfer in a comfortable bus.